Traffic safety advocates put a lot of effort into educating teens about the responsibilities and dangers associated with driving a car. It seems reasonable to expect the statistics on distracted driving among younger drivers to be declining. According to the AAA Foundation for Traffic Safety, distracted driving among teens is still a very serious and threatening issue, even more so than previously thought. 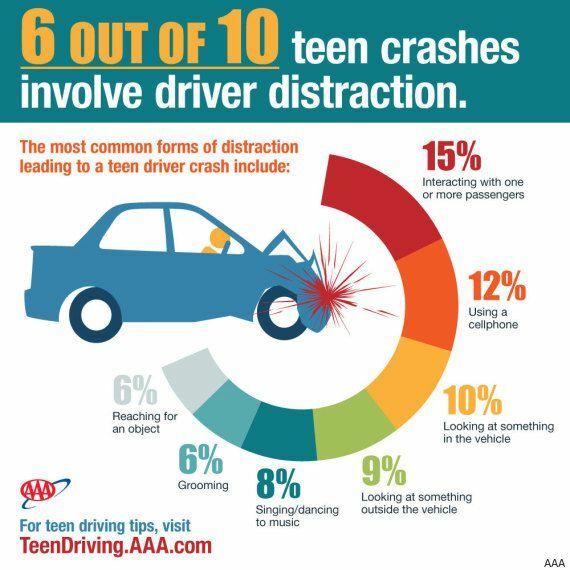 How Does Distraction Affect Teen Drivers? Two of the more obvious types of distracted behavior we expect to see from teens – interacting with fellow passengers (15%) and talking on a cell phone (12%) – made up the most frequent contributing factors in a distracted driving collision. Looking at something inside of the vehicle (10%), looking at something outside of the vehicle (9%), singing and dancing to music (8%), grooming (6%), and reaching for an object in the vehicle (6%) accounted for the remaining types of common distracted behavior. According to the report, teens who were distracted by a cell phone took their eyes off the roadway for an average of 4.1 seconds out of the final 6 seconds before a crash occurred. For perspective, that’s nearly enough time to travel the length of a 100-yard football field at 55 mph. Collision data shows that teen drivers have the highest crash rate out of any group in the United States, and common sense along with anecdotal evidence suggest they are also among the highest likelihood of being distracted behind the wheel. It’s very possible that the actual rate of distraction is much lower what was found in the AAA study, as 1,700 subjects is a relatively small sample size for an issue that realistically involves a much larger number of people. According to AAA, an estimated 963,000 teen drivers (age 16-19) were involved in crashes in 2013 – the most recent year for which data was available. There were a reported 383,000 injuries and 2,865 deaths from collisions involving drivers from this age group.